I am reminded that, on this day, 30th December 1813, British forces burned down Buffalo. In the interests of mutual harmony, I shall refrain from further comment. For now. Now if only the weather was always like it was last week, we wouldn't even think of going to Florida. I walked up the lane in almost springlike sunshine, noting that our neighbour was sporting some seasonal headgear. And here's last summer's bird's nest exposed like one of those half-demolished houses. I'm eyeing the fetching pink sunhat hubby got me for Christmas and wondering how to pack it. I expect I'll have to wear it. I don't do travelling light. 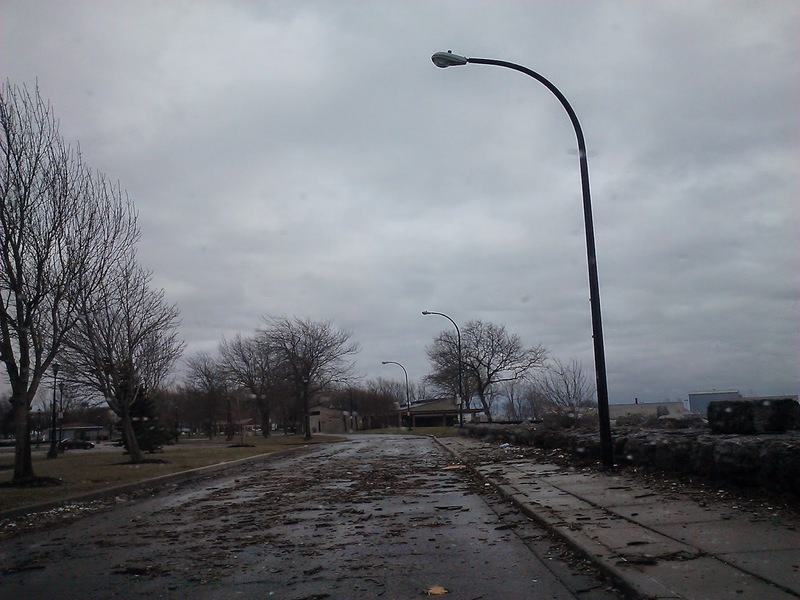 The road along by Buffalo Marina was strewn with driftwood, washed over the wall from the lake. The waves must have been quite something. The wind enough to upend an appropriately festive-looking dustbin. But still no snow to speak of. Whatever happened to western New York White Christmas? Looks like they had more in Manchester. And greetings from Santa/Father Christmas's reindeer, Chet (left) and Angel outside the hobby shop in Buffalo. Here's a close-up of Chet, who's 6 months old and a bit tired. Reindeer really do have amazing feet, designed for walking on and digging up the snow. Queuing to get on it. And inside, a slightly smaller model train set chugging away to the screaming delight of visiting kids. At least some pleasures don't change. I noticed there's a church and a mosque. And I suppose these days there's got to be a windmill in there somewhere. Notice the helicopter too. The Christmas train has a sweets car saying "Nice". And the dodgy lawyers' office is still there. And here's a Christmas crib, though this time I'm cheating and it's not in America but in the Hidden Gem church in Manchester (see below). A city of many beautiful sights. Such as interesting pub signs..
A wild and wonderful statue of Chopin, who played in Manchester just before he died. with stalls from Germany and Italy and France and Finland, with several kinds of Gluhwein, Irish coffee and the like. Not to mention more local delicacies. Mr Falcao does his stretches. Gently, please! Gently! And the most beautiful sight of all. Not that I have anything against you Scousers out there but it's only fair after last season, when we had the same result in reverse. On the way to the airport, we swung by the Marina and Buffalo Harbour. Though not to check on the boat, which is hibernating in a local farmer's barn. It was odd to see the floating docks removed and emptiness where ranks of boats bob in the summer. We wondered what this dredger and tug (tugboat to my American friends) were up to. They were dredging something up. All kinds of possibilities present themselves. Mafia victims? Sunken treasure? Perhaps they were making Lake Erie deeper to make it suitable for submarines. Perhaps it goes with those strange buoys that have been appearing that look like eyes on sticks. We always smile and wave when we pass them, just in case. But whatever it was, it was going to take them a seriously long time. I expect we shall never know the real truth. Though one thing we did learn. The Lake was very very far from being frozen over, so we can all look forward to some more thrilling Lake Effect Snow. The blog is on its travels for a couple of weeks. But hang in there - something may well appear. Watch this space! People driving down Walnut Street a few weeks ago, could be forgiven for doing a double-take. 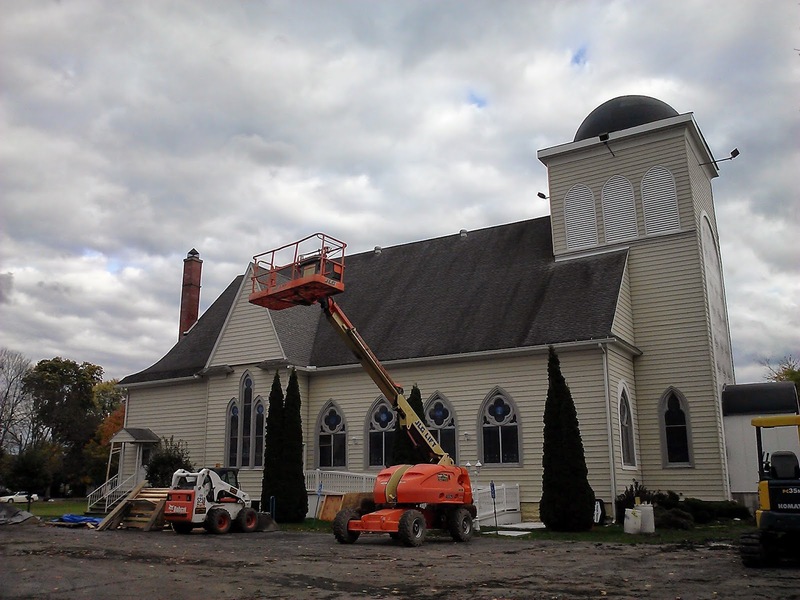 The former Transfiguration Catholic Church was having its steeple removed. “Trans” as locals affectionately called it, used to be the heart of the old Polish community, nestled in a district of typical western New York wooden houses. Then, five years ago, the church was closed and the parish merged with another one in town. But it turned out to be not just an end but also a beginning. That bit of the story started three years ago, when disaster hit another church building in Olean. The historic St Joseph’s Maronite Catholic church, built in 1919, went up in flames caused by an electrical fault near the altar. It was a sad day for the town. It may seem odd to have a Maronite community here in western New York but here they have been for over a hundred years. The Maronite Church’s origins lie in the ancient Christian city of Antioch and the name comes from the 5th century hermit and monk, St Maron. Maronites are scattered throughout the middle east but particularly in Lebanon. Their Church community is one of many Eastern Rite Catholic churches, in communion with Rome but with their own distinctive liturgies. The forebears of the present-day Olean Maronites came to America either to escape persecution or, like so many other immigrants, just wanting a better life in the Land of Opportunity. Many set up small businesses - garment shops, grocers’ and the like. Their descendants still own, among other enterprises, a popular local restaurant – the chef’s mother came from Lebanon - and what I reckon is the best dry cleaners’ in the world, name of John Ash. They’re so good, we even bring them clothes to clean in our suitcases from Britain. Every year the Maronites have a festival, the Mahrajan, which all Olean likes to attend for its great food – the baklava is the best – not to mention its traditional belly dancers. After St Joseph’s burnt down, the Maronites were offered temporary sanctuary in Transfiguration Church. They went on to buy the church and the current building works, as Father Anthony Salim, whose grandfather came to America in 1911 explained, are all part of a plan to make it more in tune with the Eastern Rite traditions. For one thing, the statues have been removed, to be replaced by icons. And that explains why there's now a dome, not a steeple. And the good news is that it's still a church. 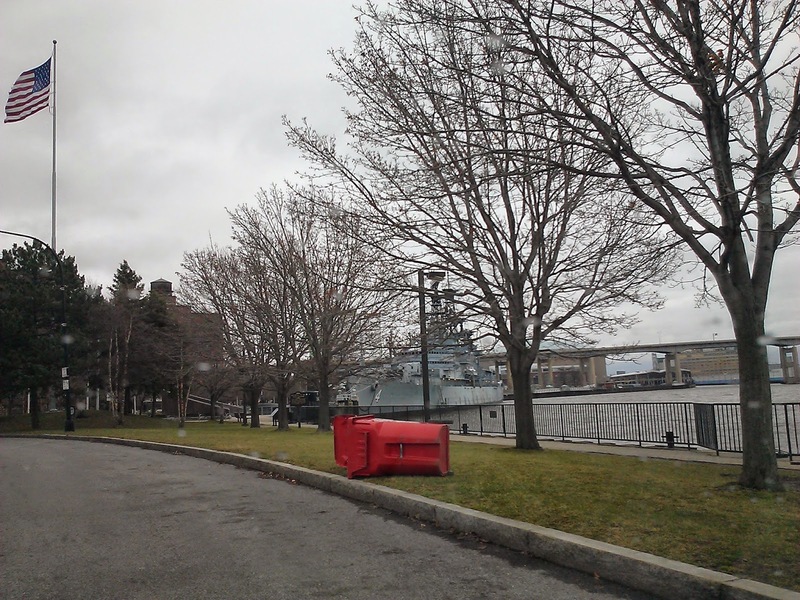 A reader has chastised me for painting an unfair picture of her city. Here it is, seen from our boat. "As a life long resident of Buffalo NY I take exception to your comment that Buffalo doesn't have much going for it. Apparently you have not been to Buffalo in a number of years or checked out what is going on in Buffalo. Buildings are being built, old ones are being rehabed as multi purpose apts, offices & retail. Waterfront is alive and well, over 800 events are held from May to Oct. the medical campus employees employees over 13000 people with growth should have 17000 within 3 years. Business are moving to Buffalo. You need to visit and have the convention and visitors bureau show you all that has happened and is happening now. It is a "new and renewed city" Barbara from Buffalo. I take your criticism on board, Barbara. 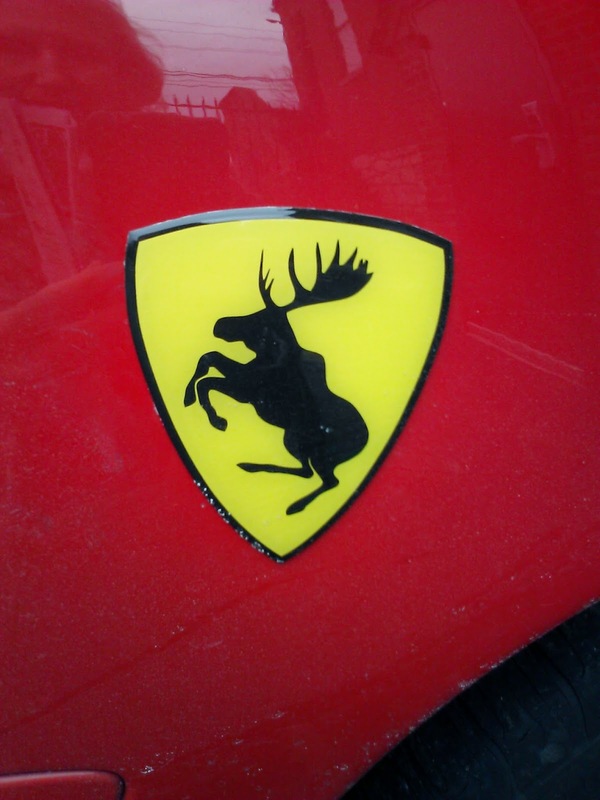 Alas, Londoners can be very arrogant about other places.Though I have to say in my defence that I'm a frequent visitor to Buffalo, as this blog will attest and have said some nice things about it too. I agree that, amid the swathes of urban dereliction, there are signs of new life, not to mention the many lovely old buildings. So let's hear it for Buffalo! But speaking as a foreign observer, a few attractive cafes at the waterfront (and particularly at the marina, where I spend a lot of my time trying to avoid looking at ugly concrete and queuing for hours to get an ice cream) would prove that it really is alive and well and not just functioning on life support. Until that happens, I hope that Barbara and other Buffalonians will forgive me for retaining a little scepticism! Spotted in an Ohio car park, where one local Volvo owner evidently has a sense of humour. In deference to my feathered friends above, I will not be mentioning T**********g. But I hope everyone else has a happy one all the same! Where we ventured for some Christmas shopping, the roads are mostly clear. It was odd how there was hardly any snow until we reached the southern suburbs. Then, suddenly, there it was. Though the TV crews were still hopeful ..
TJ Maxx car park was a maze..
And in Starbucks, life went on.